The Holton property is a twenty-five acre coastal lot adjacent to, and once belonging to the Tadenac Club. The Tadenac Watershed covers over 9200 acres; the majority of the area has undergone little or no significant human disturbance in more than one hundred years, allowing for the persistence of an intact natural area with high quality habitat for a full spectrum of floral and faunal species from thriving fish populations to mammalian high carnivores such as Eastern Wolf. 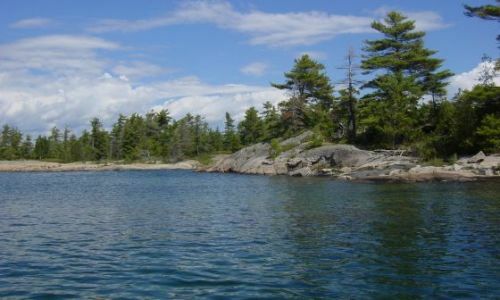 The Holton Reserve includes a diversity of coastal and interior wetlands as well as the typical Georgian Bay upland complex of acidic rock barren and White Pine – Red Oak – Red Maple forest. Holton likely supports populations of species at risk such as Map turtle, White-fringed Orchid and Carolina Yellow-Eyed Grass. I have spent the past two weekends at Indian Harbour on the boat. It’s a great spot to anchor for a few days and “gunk hole” around. I used to go there 35 years ago. This past weekend (July 12/13) we saw the heaviest rain and wind storm I have ever experienced on Georgian Bay. Even inside the harbour the wind blew another boat off its anchor which hit us at anchor. Had we not been where we were that boat would have been on the rocks. Earlier the same day my brother Gord and I saw a pair of Sandhill Cranes and for the first time in my life, saw a Skink. Georgian Bay is such a great place. One minute showing off all the glories and the next minute blowing your shorts off.